The Laboratory holds strong collaborations with more than 12 research institutions, medical centers, universities and research laboratories throughout Bulgaria, Europe, Japan and USA. These joint initiatives involve research in the fields of Molecular Genetics, Epigenetics and Cancer biology. The Laboratory of Molecular Genetics at the Institute of Molecular Biology is looking to take part and join consortiums which intend or are at the process of preparing applications to HORIZON 2020 calls related to HEALTH, PERSONALIZED MEDICINE, BIOMEDICINE and BIOINFORMATICS. We can offer excellent Molecular Biology and Genetics experience and facilities for studying of chromatin, epigenetics, DNA damage and repair, cellular ageing and senescence on different model systems like yeast, cell cultures, mice and also samples from patients diagnosed with different diseases. We can offer next-generation sequencing, proteome analyses, high-resolution light and fluorescent microscopy, FACS analyses, etc. We have participated in projects related to chromatin structure and dynamics, ageing and age-related diseases, DNA damage assessment, development of new molecular markers for cancer diagnosis. 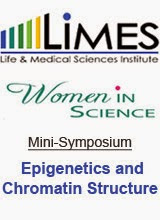 If you are interested, please contact Dr. George Miloshev at gmlab@chromatinepigenetics.com.